What was once a successful loyalty program has now evolved into something even better as Western Union introduces an innovative rewards program to compliment their My WU program. My WU unlocks a world of products and services to help Filipinos move money for better. With one personal number that My WU gives, every registered member will be granted exclusive privileges and rewards. With My WU membership, there are no cards, just a faster and hassle-free transaction processing. My WU’s user friendly interface in www.mywu.com/ph allows members to easily access their My WU Membership account, check their points balance, rewards they are eligible for and redeem these rewards online. If in need of any assistance, My WU’s customer care service has enhanced call center tools to make addressing concerns and inquiries simple and speedy via customer service hotline no. 888-1200. “For 25 years, Western Union has been helping millions of Filipinos in moving money for better and to reinforce this commitment, we have introduced a rewards program to give consumers the preferential care they deserve. The My WU membership rewards program is better than its predecessor, the Gold Card program as it adds essential value to every migrant’s contributions through points and rewards,” says Patricia Riingen, Western Union, senior vice president, Southeast Asia & Oceania. My WU points and rewards will accumulate for members sending and receiving funds through the Western Union service. Every domestic transaction (send or receive) will earn 10 My WU points while international send transactions earn 30 My WU points and international receive transactions earn 10 My WU points. This year, members can redeem rewards and enjoy a McDonald’s Crispy Chicken Fillet meal or a sundae cone for every 100 and 50 points, respectively. My WU members also stand the chance to win big at a monthly raffle. All eligible international and domestic transactions made by My WU members within a particular month will be automatically entered into a raffle draw to win exciting prizes such as Family Phone Bundle, Scholastic Package, Kitchen Showcase, Bedroom Enhancement Package, Smart Gadgets Package, Family Luggage Showcase and Family Entertainment Package. Term and conditions apply to the above rewards; please visit any Western Union® Agent location or www.mywu.com/ph for details. 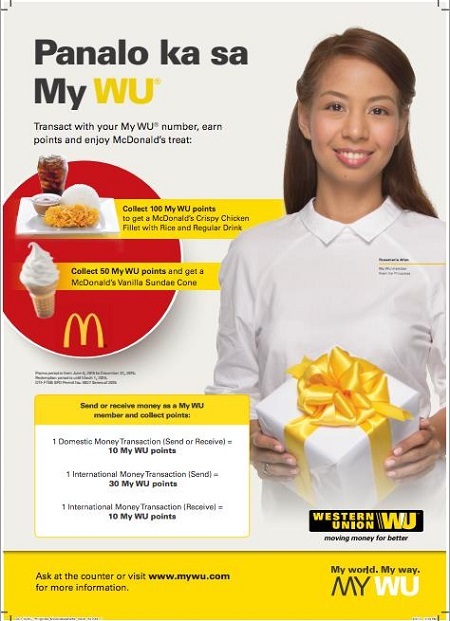 To apply for free membership, register at www.mywu.com/ph or at any Western Union Agent location.